The stuffed animals/Soft toys are always cluttered all over the house. I was always on the look out for a organizing solution for the stuffed animals. I saw this awesome handmade stuffed animal net at A Lemon Squeezy Home and wanted to make one. But after Washing/Cleaning of stuffed animals, I just needed a fast solution! 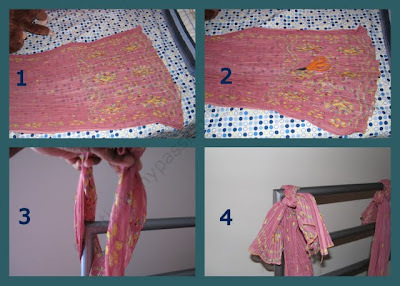 So I made a 10min Hammock from an old Dupatta. I tied the hammock to the headboard rails of CJ's bed. I tied one more hammock in the lower headboard rails. Storage for CJ piggy pillow and hand puppets. Now that all her soft toys/Stuffed animals are on top of her head, she kept a bedtime story book in the hammock for them. CJ just loves the hammock. I feel its a perfect place for the toys. When she goes to bed, she can choose her cuddly friend. At the bedtime story time, CJ says mommy my animal friends want to read "Hop on Pop book"/ "Go,Go,Dogs book"/"A little engine that could"... After we complete the book she looks at them and asks hey friends did u like the story? She giggles and says mommy they loved it! 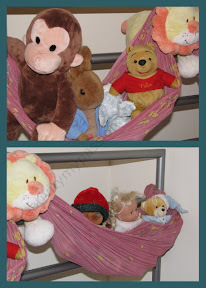 Rhyme - Ten in the Bed and the little one told We played the rhyme with the stuffed animals lined up in the hammock. There was only one dolly left in the bed and the little dolly said, "I'm lonely! I'm lonely!" So they all got back in the bed. There were ten in a bed and the little one said, "Good night, Sleep tight! Don't let the bed bugs bite!" Ten in the Den book is a hit at our home. CJ adores author John Butler books, we have read his books since she was 2 yrs old and they continue to be her favorite. On the Author's website, this page gives few illustrations of the book. In the book, the author represents the fall of the animals in rhyming words and their own animal style - Porcupine goes Prickly, Tickly, bump; Bear goes Bumpty, Thumpty, bump; Rabbit goes Floppettty, Hoppety, bump... 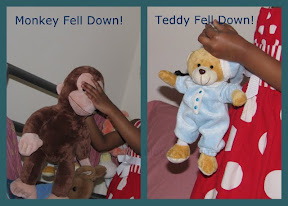 When we played Ten in the Bed rhyme, with each fall we used the rhyming words from the book and for some of the animals we made our own rhymes like Slippery, Slippy, bump for Snake; Roary, Scary, bump for Lion. We love this song too! Do you know the book 'Ten Out of Bed' by Penny Dale where the teds go off for some adventures? Lovely to see you at the Play Academy again - thanks for linking up! Hi Cathy, We have not read the book "Ten out of Bed". Looks interesting may be we have to get the book from the library. Do you know the book "Ten in the meadow" By John Butler where the bear is it and the animals play a game of hide and seek. How fun! My kids LOVED that story when they were little. What a fun way to share it!